A Haitian child’s most pressing needs (after his spiritual needs) are perhaps his immediate physical needs: food, shelter, and clothing. At the Starfish Ministries Orphanage, all of the sponsorship funds go directly to meeting the child’s need, with the majority going toward these physical needs. Food is the largest monthly expense. Children also receive uniforms to wear to school as well as other clothing to wear at the orphanage. And, of course, they are assigned a bed in a room they share with seven other children. 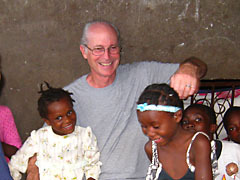 Health Care in Haiti is not what we’re accustomed to in the United States and Canada. However, one of Starfish’s sister ministries (Church of the Open Door in Crystal, Minnesota), sends a medical team to Tricotte yearly, administering immunizations and basic health maintenance to the children. 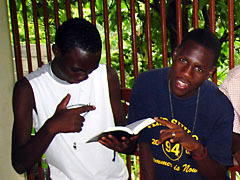 Other health needs are handled by the orphanage staff or Starfish team members. Sometimes we forget here in the United States and Canada that Haitian children have all of the same emotional needs as our own children. At the orphanage, the house parents provide the kind of love and nurturing necessary to a child’s development. Older children are active with the younger ones. And the village as a whole offers a great deal of emotional support. 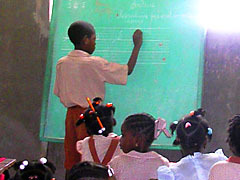 Lack of education is one of the primary causes of the problems in Haiti, both those of individuals and of the nation as a whole. At Starfish, we believe it is necessary to take responsibility for the education of the children at the orphanage in the hope that they will one day be able to provide for themselves and their families and improve the plight of their communities and their nation. What does it profit a man if he gains the whole world but loses his soul? And what have we at Starfish accomplished if we feed an entire nation but ignore its spiritual needs? 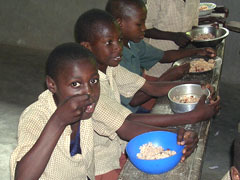 At Starfish we are very conscious that our responsibility to these children is not merely temporal. We believe that the instructions and promises in God’s Word regarding child rearing apply to us and our Haitian children just as they apply to families everywhere. Children in the Starfish Orphanage are given a Christian upbringing, complete with biblical instruction and Christian values.